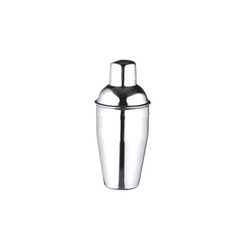 Description: Uniquely designed stainless steel cocktail shakers, which are manufactured from quality checked metal to ensure durability and reliability. We provide our clients with a wide range of cocktail shaker which is made of using finest quality stainless steel. The cocktail shakers offered by us are known for features like elegant designs, perfect finish and lasting shines. These high quality cocktail shakers can be availed from us at competitive prices.